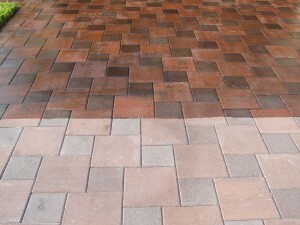 Do you carry any sealers that DO NOT darken the pavers? that their appearance would totally change once it was sealed. Amaretto which when sealed DOES NOT change its appearance. Thanks for contacting us. We are sorry to hear about the missed expectations you’ve experienced with another company. Most of the time, a wet look sealer is what people use by default, but yes there are alternatives on the market which don’t change the color of the pavers too much. Instead of a gloss, wet look, there are sealers which have a satin, more natural finish. In your case, however, our recommendation would be to just give your pavers some time. Something your contractor might not have explained to you is that sealer fades over time. Quite dramatically, in fact. After your first sealing, your pavers will typically be back to the way they looked prior to sealing within a year. The sun simply takes a toll on the product and reduces the luster and wet look over time. In order to strip pavers of their sealer, you have to use caustic chemicals, Xylene specifically, which is essentially a paint thinner. This process doesn’t generally produce uniform results and is costly to do. That’s why we’d recommend just giving it some time and let nature return your pavers to their pre-sealed condition. If you would like one of our owner’s to come out and visit your home to assess things further, please don’t hesitate to call or submit an online appointment request.